Based on estimates in EIA's most recent Drilling Productivity Report, production of natural gas in the Permian Basin averaged 10.4 billion cubic feet per day (Bcf/d) in June 2018, which was 2.1 Bcf/d more than in June 2017. Much of this increase in production is associated natural gas, or natural gas produced as a byproduct of the increase in oil production from oil-directed rigs. 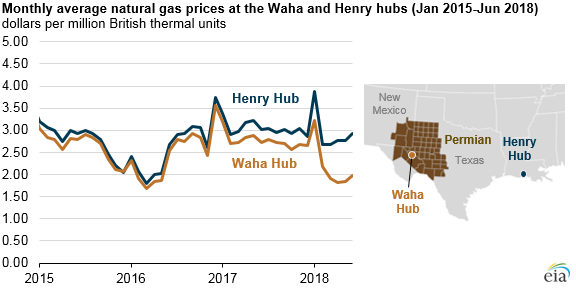 As a result, the increase in natural gas production closely correlated with the increase in crude oil production in the Permian Basin, which averaged 3.3 million barrels per day (b/d) in June 2018, up 0.9 million b/d from the June 2017 level. Two pipelines—Comanche Trail and Pecos Trail—were completed in 2017 to export Permian natural gas to Mexico. Although these pipelines have a combined takeaway capacity of 2.6 Bcf/d, they are not expected to see significant flows until late 2018 or early 2019 when downstream pipeline infrastructure in Mexico enters service. 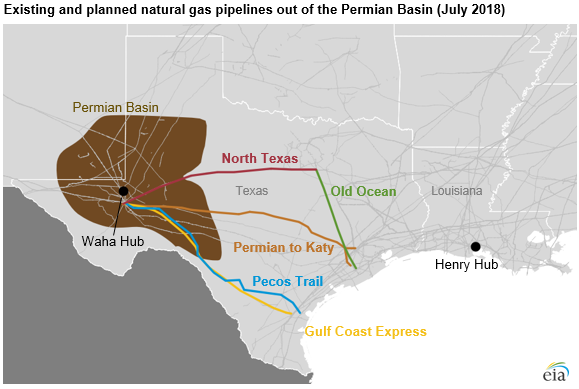 The only other project expected to come online in 2018 is the combined expansion of the North Texas Pipeline and resumption of service on the Old Ocean Pipeline, which collectively will increase pipeline capacity out of the Permian by 0.15 Bcf/d.